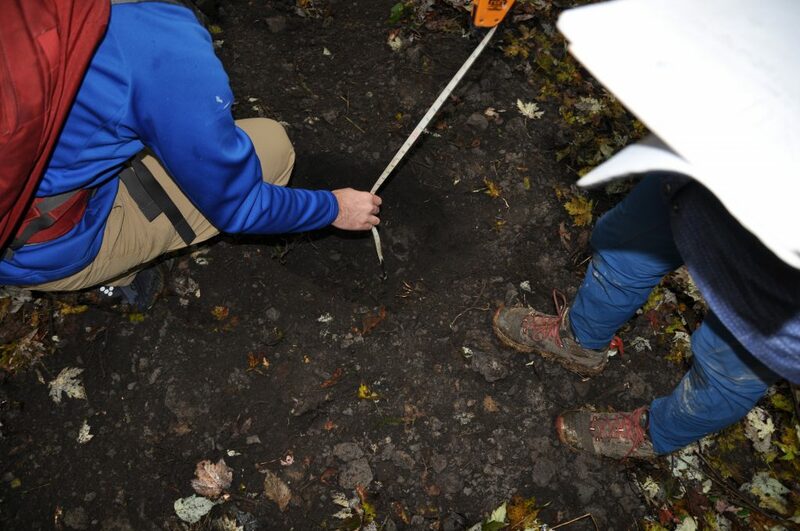 This semester, the Geomorphology class from the College of Wooster Earth Sciences department went to several local field sites to study geomorphological features, soil catenas, groundwater flow, and other investigations. 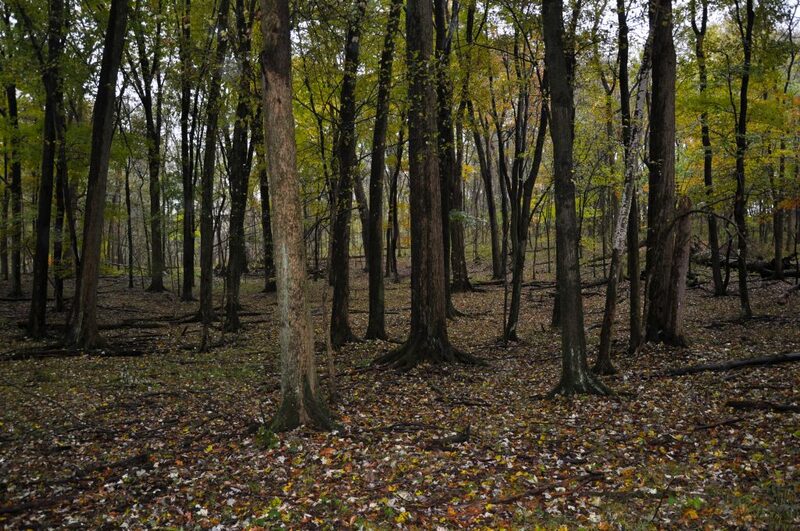 One of these sites was Browns Lake Bog, a preserve located near Shreve in Wayne County, Ohio and run by the Nature Conservancy that was established in the 1960’s. 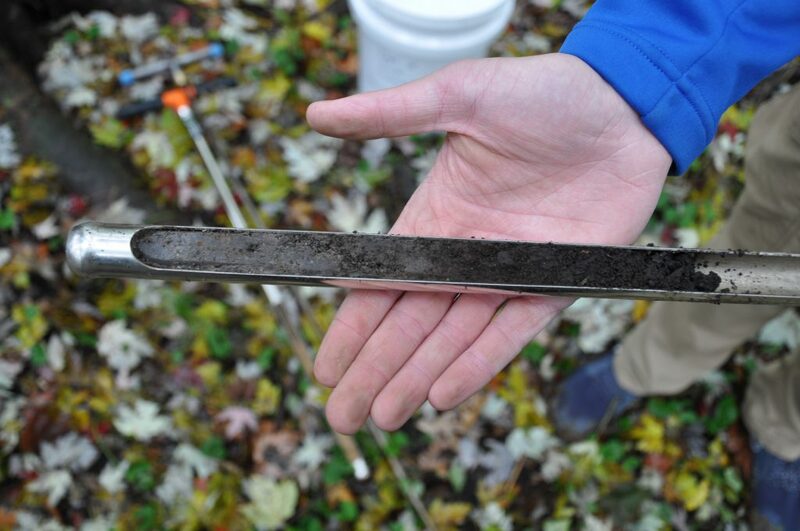 College of Wooster students have been involved in several past projects at Browns Lake Bog including tree coring, sediment coring and lake drilling. It is one of a handful of sites in Ohio which contain an open kettle lake surrounded by a floating sphagnum moss mat (ODNR, 2018). The bog, lake, and hill features here are glacial relicts formed after the last ice age (~20,000 years ago). 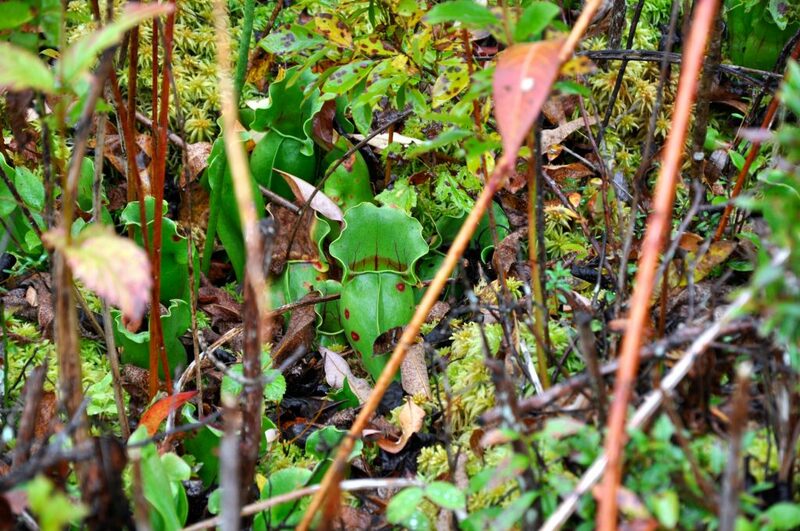 The preserve is known for its unique boreal plant community which is supported by the special acidic properties sustained by the presence of the sphagnum moss and its insulative capabilities that protect the community from drastic air temperature changes. More than twenty rare plant species can be found here including round-leaved sundew, large cranberry, and grass-pink orchid. 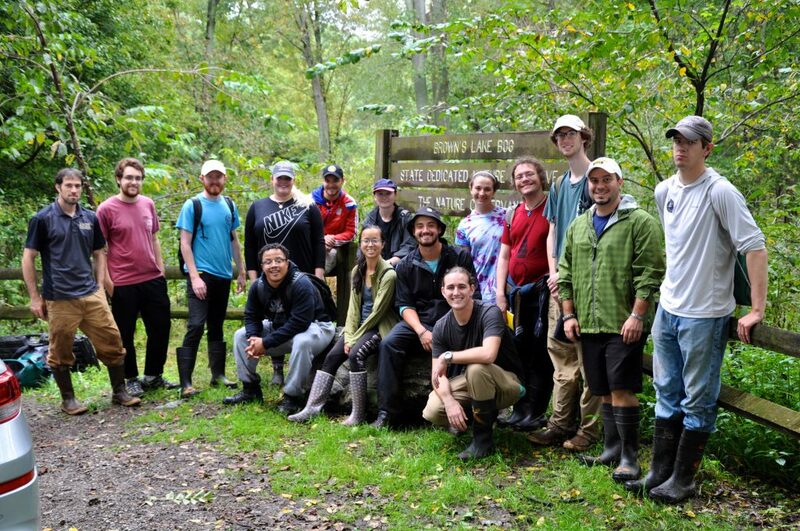 The 2018 Geomorphology class at the entrance to Browns Lake Bog. The carnivorous Northern Pitcher Plant (Sarracenia purpurea) receives nutrients by trapping insects in its fluid-filled cavities. 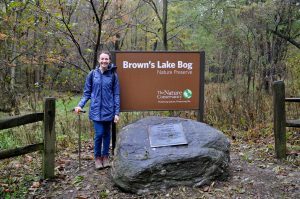 The geomorphology class went to Browns Lake Bog to study the glacial features and soil profiles across the preserve. The knolls in the northeast corner and southern part of the property are glacially formed hills called kames. These features form from the collection of sediment on top of the ice during glaciation and are left behind when the ice melts. The open lake at the preserve is known as a kettle lake, a depression also left behind from the glacier. The geomorphology class focused on creating a sediment profile from the top of the kame to the bottom, taking several soil cores to form a soil catena. Diagram showing the formation of kettle lake and kame features similar to those at Browns Lake Bog. 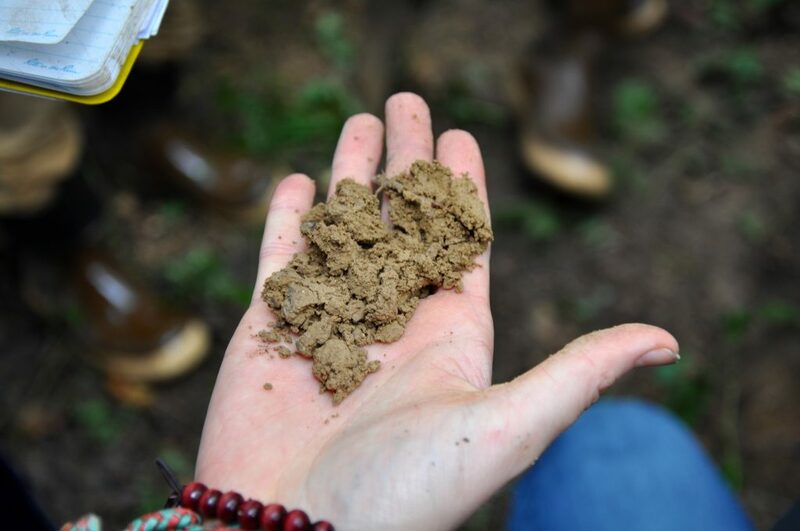 Soil from sample location at the top of kame. 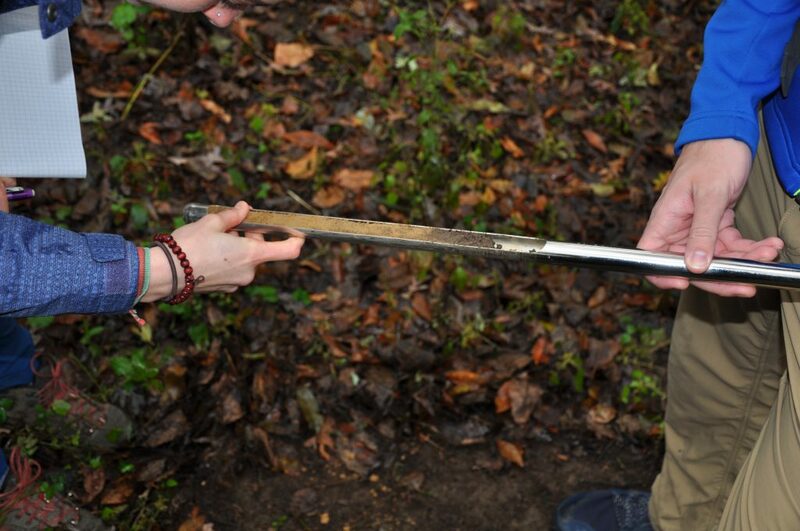 A sediment core taken at the bottom of the kame showing a dark peat layer and ancient lake sediments. The cores revealed a high organics content at the bottom of the kame and a deep layer of loess on the top of the kame. Loess is a term used to describe wind-blown sediment that has accumulated over time since the last ice age. The loess cap is thickest at the top of the kame and thins as you move down towards the lake. Claire Wineman expanded on this soil catena study for her Geomorph project. Claire at the entrance to the preserve. Cross section showing general sample locations used in Claire’s study. Looking up at the kame from the trail. Soil profile at the top of the kame. Deep loess layer (silty light brown sediment). Claire took samples from three locations along the kame. One at the top, middle and bottom. 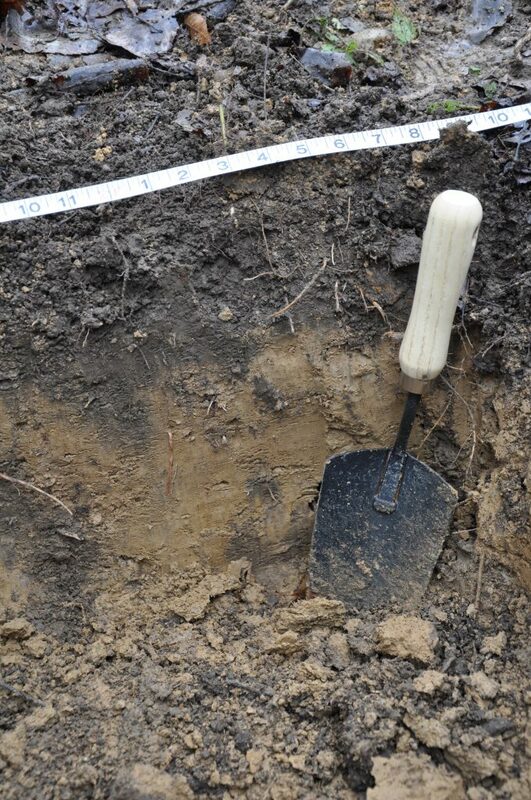 The soil pit at Site One (top of kame) was 10 inches wide and 12 inches deep; the soil pit at Site Two (middle of kame) was 13 inches wide and 12 inches deep; and the soil pit at Site Three (bottom of kame) was 16 inches wide and 12 inches deep. 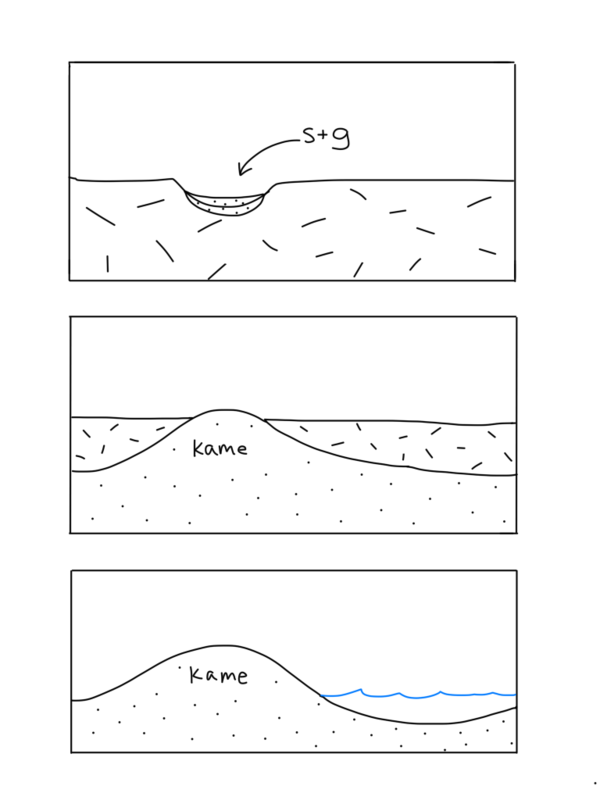 The top of the kame has much lighter soil and a thick loess layer. Sediment at the bottom of the kame was much darker and rich in organics. It had gray lake clays instead of loess. 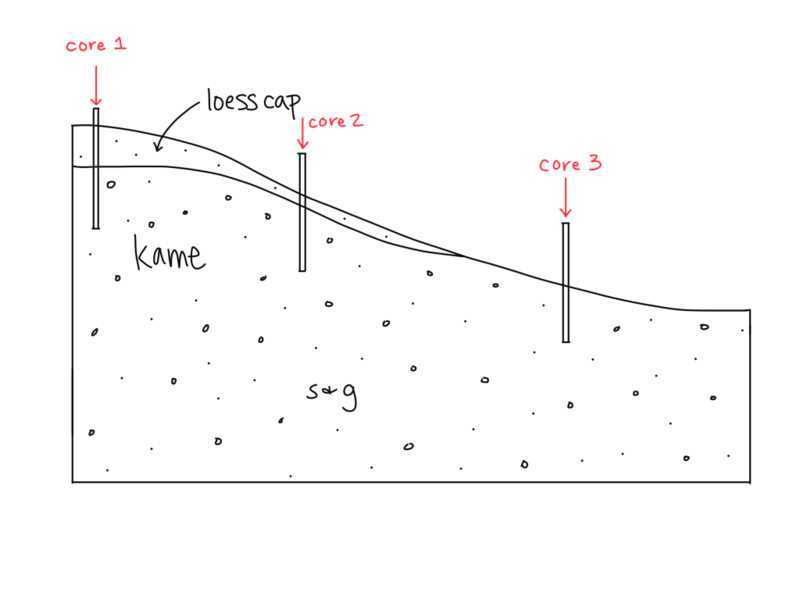 The top of the kame’s loess layer was thicker than the middle showing that that loess cap thins as you move down the hill. Claire reports that the soils at Site One and Site Two at the top and middle of the kame, respectively, largely consist of alfisols and are significantly less acidic and contain far less organic material than Site Three. 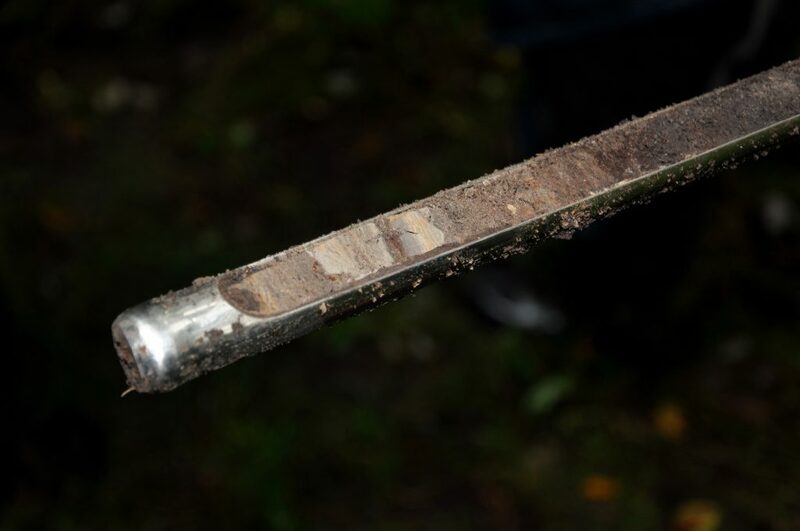 Sediment core taken from same location at the top of the kame showing soil profile. Note the thickness of the loess layer which is lighter in color. Claire reported two inches of organic O horizon and ten inches of clay loess B horizon. Hole dug at the base of the kame. Note the soil darkness which indicates a richness in organics due to the dominance of histosols in the bog and at the base of the kame. Sediment core taken from same location. Note the dark peat layer at the surface and lake clays towards the bottom. Claire reported a dominant O horizon and portion of lacustrine clay lens.